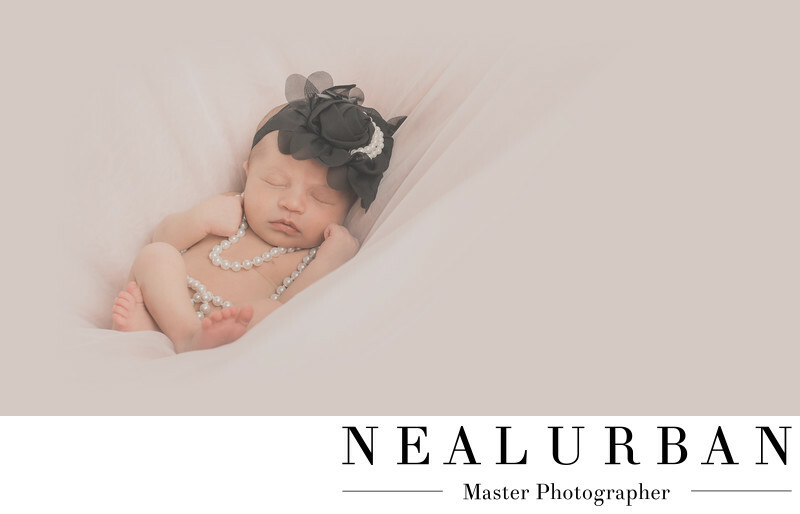 Baby Ella was so amazing to photograph on her newborn session at Neal Urban Studio! We have done many photo shoots for her family! We started off our relationship with engagement photos, then onto wedding portraits. We have done christmas sessions at our studio. Then maternity and now newborn portraits. We know it will not end there! We have another family portrait session coming up and Ella's first birthday cake smash photos! Newborn photography takes a lot of patience for both the photographer and parents. Sleeping baby photos have been the trend for the last few years! We tell the parents in advance, the studio will be very hot, and the shoot can take a few hours. We have mom feed the baby before they arrive at the studio, or right when they get there. The goal is to have the baby milk drunk. That is an industry term that means, the baby will be in a deep sleep! This way, we are able to handle the baby and create images like this! Lindsey and Josh have had almost of their photo sessions done in a rustic style. They are both very outdoorsy! So, we try to make sure we can make those ideas come to life for every shoot. We did keep the rustic theme and used an old wooden fence we found, but I do love accessories! Lindsey sent over some photos of the outfits she had. I loved this head band! And mom brought some pearls! So, to start off the session, we decided to go glam and girlie! We laid Ella on a giant bean bag and covered it with some sheer material. Very simple. She did the rest! This little newborn was out like a light. All we needed to do was cross her legs so we could see those little toes! Location: 2495 Main St Buffalo NY 14214 United States.